Those weapons of mass destruction have to be somewhere. Nope, no weapons over there. Maybe under here. 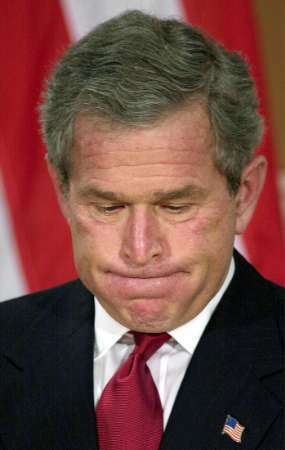 ~ George W. Bush (1946-07-06 age:71), 2004-03-25, Radio and Television Correspondents Association dinner joking about how he tricked his country into invading Iraq by crying wolf over nuclear war. See, we love — we love freedom. That’s what they didn’t understand. They hate things, we love things. They act out of hatred; we don’t seek revenge, we seek justice out of love. We’re talking money here, son, not just lives. There’s only one person who hugs the mothers and the widows, the wives and the kids upon the death of their loved one. Others hug but having committed the troops, I’ve got an additional responsibility to hug and that’s me and I know what it’s like. If you find a neighbor in need, you’re responsible for serving that neighbor in need, you’re responsible for loving a neighbor just like you’d like to love yourself. to Tucker Carlson reported in Talk Magazine Vol 1 No 1 Devil May Care pages 103-110 1999-09, mocking what Karla Faye Tucker said when asked What would you say to Governor Bush? prior to her execution by lethal injection. ~ George W. Bush (1946-07-06 age:71), 2003-07-03, taunting Iraqis to butcher Americans, from the Roosevelt room of the White House in a speech primarily about AIDS (Acquired Immunodeficiency Syndrome). When one of us suffer, all of us suffers. Bush, addressing the Pennsylvania coal miners Source: The Nation, W. and the Coal Miners: Photo-op Cover for Anti-worker Policies , David Corn, 2002-08-06.